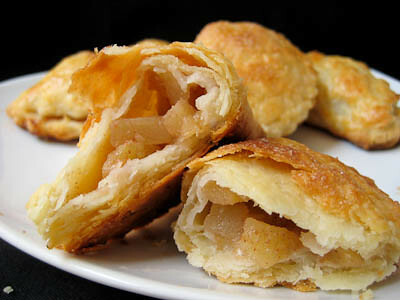 This week's Tuesdays with Dorie (TWD) recipe was chosen by Julie of Someone's in the Kitchen: Flaky Apple Turnovers. I love anything apple and this was the perfect way to celebrate the upcoming arrival of fall. The pastry dough was pretty easy to make, but in my attempt to not over work the dough, I think I under mixed it. After the first refrigeration period, I found it way too crumbly and dry to roll out... in fact, I went to double check the recipe to see if I had messed it up somewhere along the way. Turns out I had followed the recipe to a "T" so my only conclusion was that I needed to mix it more thoroughly. So kneaded it together with my hands to more fully incorporate the flour, and then I was able to roll it out without any problems. Thankfully this did not ruin it and I still ended up with a nice, flaky pastry. I have to admit that I ate the vast majority of these apple turnovers myself! (I like to use the excuse that I am eating for two.) The pastry was super flaky and buttery... and the apple filling was sweet and delicious. I did add four times the amount of cinnamon recommended, and thought it was just right... so I think it would be a bit bland if you didn't increase the amount of cinnamon. Otherwise this recipe is spot on. Thanks Julie, for picking this recipe. The turnovers were great and I would definitely make these again. If you would like the recipe, you can find it here. 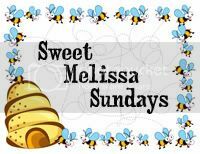 Make sure you check out the TWD Blogroll, to see how everyone else enjoyed this wonderful fall treat. - I used 1 tsp of cinnamon in my apple filling (instead of just 1/4 tsp). - These can be frozen after they have been assembled (but have not had had the egg wash applied yet). You can freeze them up to 2 months. Just bake them straight from the freezer without defrosting and add a few minutes to the total baking time. I LOVE LOVE LOVE a good turnover. my favorite one is with apricot jam, but with the apple it is surely worth a try!!! As always, the ending result looks PERFECT, no matter if you had any difficulties with dough, filling, or what :) Love it! Those are just flaky and gorgeous! You can't even tell you had to reknead it. And I agree about the filling : pastry ratio; it's why I like using pie crust for turnovers instead. Really GREAT photos Jaime! You can see clearly just how flaky the pastry was. They look delicious! I like a lot more fruit in mine as well and it always seems to seep out the sides or find a hole in the top to bubble out of. 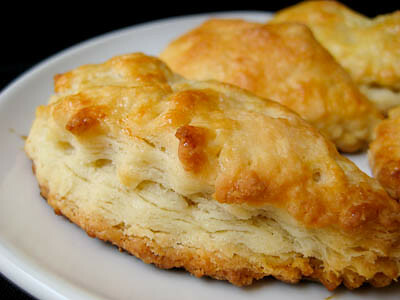 You did a great job photographing how flaky the turnovers are! I think I'd eat most of them myself too! these babies definitely qualify as flaky! and of course you ate a lot of them yourself--how could you resist? Jaime, you win for the flakiest looking crust I've seen out of all these turnovers! Wow. Looks de-lish! I agree about making them bigger so they can hold more filling! so flaky it almost looks like streudel--beautiful! Oh my. Those look so amazing. 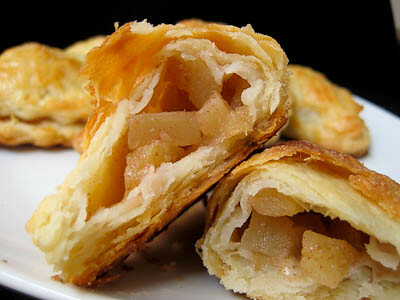 They are flaky and apple-y, and I would like one right now. Thanks for baking with me! Flaky looks like the perfect way to describe these - they look delicious! Those are beautiful. Look how flakey and brown and delicious they are. Perfect and beautiful. I'll look in my book to check the recipe. Yum! These look delicious! Anything with a flaky crust like that has to be outstanding. Your pastry is amazingly flaky Jaime! The turnovers are gorgeous! I had issues with the dough too but yours turned out a lot better than mine. Good idea to increase the cinnamon-I did think the filling was a bit bland! Oooh yum! These look SO good; I'm totally impressed! Your turnover look perfect!! So flaky! Cant believe you had problems with these! Wow, your turnovers look perfect! By far the flakiest crust I have seen on anyone's. I over-filled mine too, a larger turnover is definitely the answer. Those are some beautiful turnovers. I'm really impressed by how flaky yours turned out. Well done, my friend!